I’m not much of a coffee drinker. I have a cup maybe twice a month, more as a treat than anything. And I really, really don’t like tea. I wish I did, but I just don’t. With all the flavor possibilities of homemade biscotti, it makes me wish I drank coffee or some warm breakfast beverage more often. They are a very low maintenance cookie, and thankfully they keep very well for gifting to friends and family who are coffee and tea drinkers. This particular variety is essentially a biscotti version of a snickerdoodle, and since I think cinnamon sugar makes just about everything better, I found these to be pretty wonderful. I couldn’t stop myself from nibbling one with my glass of OJ during brunch, and my in-laws were happy when I surrendered the rest of the batch for their enjoyment. 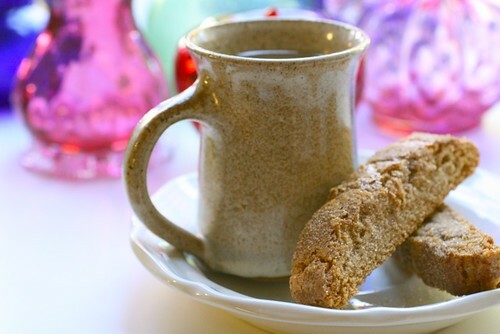 If you’ve only ever had biscotti from a coffee house or someplace similar, I encourage you to try making your own. These aren’t the sort that will require an emergency dental appointment after eating, they just have a nice crunch and leave you with a happy tummy. Preheat the oven to 325˚ F. Line a baking sheet with parchment paper or a silicone baking mat. In a medium bowl, combine the flour, cinnamon, baking powder, and salt; whisk to blend and set aside. In the bowl of an electric mixer, cream together the butter and sugar on medium-high speed until lightly and fluffy, 3-4 minutes, scraping down the bowl as needed. Blend in the egg and then the egg yolk, beating well after each addition. Blend in the vanilla until incorporated. With the mixer on low speed, blend in the dry ingredients just until incorporated and a dough is formed. Divide the dough into two halves. Shape each half into a log 9 inches long by 1½ inches wide on the prepared baking sheet, spacing the logs at least 3-4 inches apart. In a small bowl, combine the sugar and cinnamon for the topping and stir to blend well. Lightly brush the tops of the logs with the beaten egg, and sprinkle generously with some of the cinnamon sugar mixture. Bake for 40-45 minutes, rotating halfway through baking, until the tops are golden brown and slightly firm to the touch. Remove the pan from the oven but maintain the oven temperature. Once the logs are cool enough to handle, slice on the diagonal into 1½-inch slices (about 10-12 per log). Place biscotti cut side-down on the baking sheet and sprinkle with more of the cinnamon sugar mixture. Bake an additional 10-15 minutes, until crisp and golden.